A bracket to allow fixing of a dynamo on a bicycle which does not have a mounting point on the frame. This fits within the rear triangle of the frame so that the dynamo works on the rear wheel. It can be used on both sides of the bike. However, it is easiest to install it on the right hand side of the bike with a "left hand" dynamo. Note that this is sized for a traditional bicycle frame. 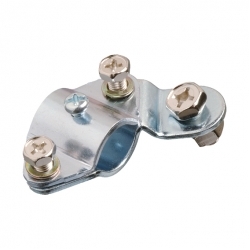 Tubing up to about 15 mm in diameter can be accommodated within the bracket with the supplied bolts. You may be able to use it with slightly large tubes if you fit slightly longer bolts.